Once again, our nation followed precise protocol for a peaceful transfer of power. Donald J. Trump was sworn in as our 45th President amidst much pomp and circumstance. Yet while the Inauguration itself was peaceful, many people are anything but, and I’m not referring to the outrageous actions of violent protesters who felt the need to destroy property and agitate police officers. I am referring to the scores of Americans, from both sides, who take to social media to put forth all manner of provocative posts, some of which easily qualify as “fake news,” which cause “likes” and “thumbs up” from their side while only serving to inflame the other. My fellow citizens and friends, I am calling for a cease fire of offensive and incendiary self-written posts and shares of others. Mind you, I am not against a respectful conversation about differences. I am not opposed to a peaceful protest. We all have convictions that we feel compelled to share. I do so all the time within the context of the Phil Henry Power Gospel. Yet I hope and pray that my Five Minute Power Messages and Power Blogs articulate and communicate my viewpoint in a way that may provoke thought, but not hate. Moreover, I am committed to non-partisan politics within this ministry. 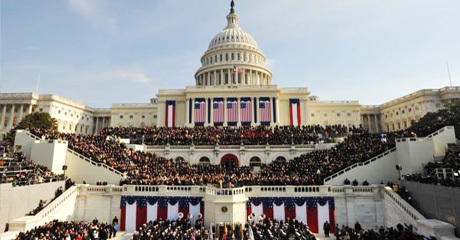 Now while I am calling for a cease fire of disrespectful posts, I am countering and asking for an inauguration of another sort; I am asking you to be committed to daily prayer for our elected and appointed leaders. Vs. 3-4 For this is good and acceptable in the sight of God our Savior; Who will have all men to be saved, and to come unto the knowledge of the truth (no need for commentary here). That’s it, my simple yet heartfelt call for a cease fire of negative posts directed towards your political foes, in particular our current or former President, as well as a former candidate. I’m also calling for an end of posts that are unduly celebratory. If and when your candidate wins, think about just giving thanks and then promptly handing the ball to the referee. Too much celebrating in the end zone is grounds for an unsportsmanlike conduct penalty. So will you join me in prayer? Instead of hitting “send” or “share” to what may easily be interpreted as inflammatory or an over-the-top celebration, let’s rather, hit our knees in prayer. Great message. Unity is what our great nation desperately needs at this very volital time in history. Awesome message, Pastor Phil! This Scripture is easy to follow when your candidate or party is in power. But it’s very important to remember when they’re not, also. God puts every ruler in position for a reason. It’s always exciting to read content from ofher authors and use a little something from other web sites.